facilities. Every week, 11 million customers pass through the doors of Morrisons stores nationwide. 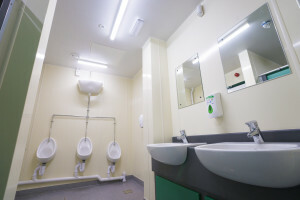 With the focus on providing the best facilities for customers, Morrisons were looking for a professional and cost effective project managed solution for the refurbishment of in-store customer toilet and changing facilities. An initial trial programme run across a number of stores yielded excellent initial feedback, and Mitton commenced a full scale rolling refurbishment designed around a three week programme at each store, working closely with store management to minimise disruption. Each individual stage was completed during a Monday to Friday working week to ensure Saturday trade was not interrupted, with experienced Mitton managers on site in store throughout the three week programme to control health and safety and to manage reactive calls. The refurbishment solution represented a total package, incorporating building works, floors, construction, joinery, decorations, plumbing, signage, power and lighting. Designing in hygienic wall and ceiling cladding solutions removed the need for wet trades, reduced routine maintenance and resulted in an easy-clean finish. The Mitton systems include the latest plumbing technology in the shape of sensor flow taps and toilet cisterns. The entire project was managed by Mitton on a fast track basis, with 25 refurbishments running concurrently to meet completion deadlines. In total, Mitton has refurbished customer toilets across 307 stores, covering male/female/disabled and babychange facilities, representing 60% of the current estate, plus staff washrooms in 49 stores. The work has resulted in an excellent finish and high quality provision for customers.